My favorite way to explore and learn the sounds of new gear and plugins is to compare them to ones I already know. I've been using the Waves JJP PuigTec EQP-1a for years. I recently received the Softube PE1C (based on Tube-Tech's enhanced version of the Pultec) and the Univeral Audio UAD Pultec emulation. 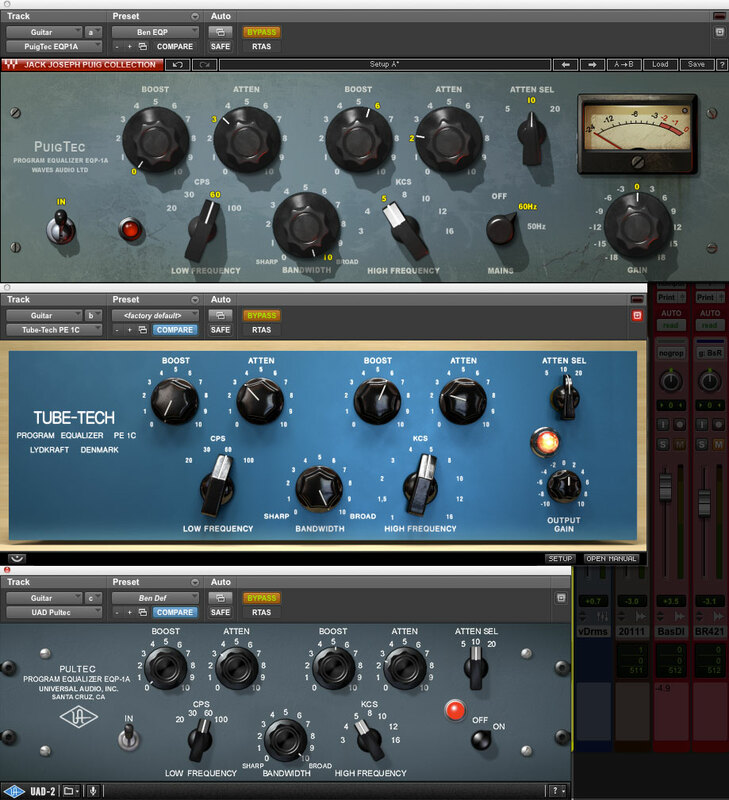 All three are based on the Pultec hardware EQ so I wanted to find out how much they differ from each other. I dialed up a good sounding setting for both a drum loop and a guitar part and automated the bypasses of all three plugins. In both sound clips you'll hear 2 bars of no plugins, then 2 bars of the Waves, 2 bars of Softube, 2 bars of UAD, then 1 bar of flat again, 1 bar of Waves, 1 bar of Softube, 1 bar of UAD. You'll hear a few pops and clicks when the bypasses are switching, try your best to ignore them and focus on the changes in tone. I don't like to try to describe how things sound in words, I just like to hear what each plugin does differently so in the future I know which one to pull out to get the sound I'm going for. 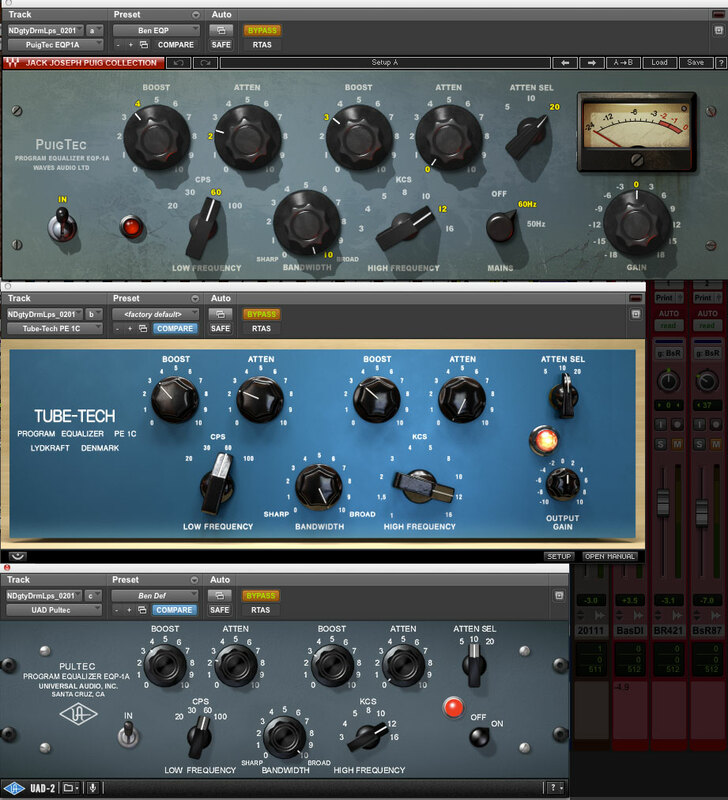 The quickest way to learn what your gear and plugins sound like is to shoot them out against each other. Take a few minutes and listen closely, don't try to make your mind up that one is better than another, just try to find the subtle differences between them. When choosing which plugin or piece of gear to use I'm always thinking in both terms of functionality and sonics. Everything I know about the sonic properties of my gear is from my experience using them, doing shootouts is a quick and easy way to learn about my gear and their subtle sonic differences. Here's the settings I used for the drum loop. I wanted to hear a little more top and bottom end, notice that I'm using the boost and attenuate control on the low end, this helps give me a bass boost without getting too boomy. P.S. there's one extra bar of no effect at the end. Here's the settings you're hearing on the guitar. I wanted to cut some of the muddy-ness out and just pretty it up a bit, but also chill out the top a little too so it wouldn't sound harsh.